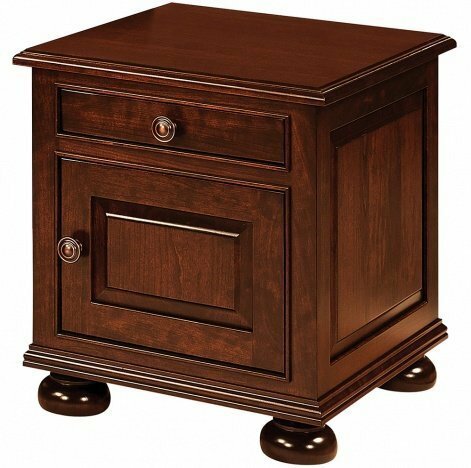 Traditional style and formal elements combine to create our Rosemont End Table. This enclosed accent table includes inset panels on the soft-close door and sides. Along with the door, a fully extending drawer provides storage for smaller items like remotes, coasters, and even a book. The 1-inch thick top will hold decorative and a refreshment, or add an optional drink pullout to hold your favorite beverage while spending time in the living room or office. Moulding details and bun feet give this table that can be customized from several different wood types a formal feel. Shown with standard 1586-2-ORB hardware.